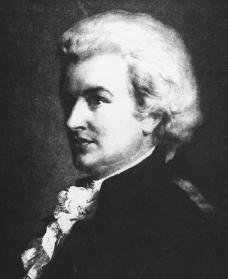 Wolfgang Amadeus Mozart was born on January 27, 1756, in Salzburg, Austria. His father, Leopold Mozart, a noted composer, instructor, and the author of famous writings on violin playing, was then in the service of the archbishop of Salzburg. Leopold and Anna Maria, his wife, stressed the importance of music to their children. Together with his sister, Nannerl, Wolfgang received such intensive musical training that by the age of six he was a budding composer and an accomplished keyboard performer. In 1762 Leopold presented his son as performer at the imperial court in Vienna, Austria, and from 1763 to 1766 he escorted both children on a continuous musical tour across Europe, which included long stays in Paris, France, and London, England, as well as visits to many other cities, with appearances before the French and English royal families. Mozart was the most celebrated child prodigy (an unusually gifted child) of this time as a keyboard performer. He also made a great impression as a composer and improviser (one who arranges or creates). In London he won the admiration of musician Johann Christian Bach (1735–1782), and he was exposed from an early age to an unusual variety of musical styles and tastes across Europe. From the age of ten to seventeen, Mozart's reputation as a composer grew to a degree of maturity equal to that of most older established musicians. He spent the years from 1766 to 1769 at Salzburg writing instrumental works and music for school dramas in German and Latin, and in 1768 he produced his first real operas: the German Singspiel (that is, with spoken dialogue) Bastien und Bastienne. Despite his growing reputation, Mozart found no suitable post open to him; and his father once more escorted Mozart, at age fourteen (1769), and set off for Italy to try to make his way as an opera composer. In Italy, Mozart was well received: in Milan, Italy, he obtained a commission for an opera; in Rome he was made a member of an honorary knightly order by the Pope; and at Bologna, Italy, the Accademia Filarmonica awarded him membership despite a rule normally requiring candidates to be twenty years old. During these years of travel in Italy and returns to Salzburg between journeys, he produced his first large-scale settings of opera seria (that is, court opera on serious subjects): Mitridate (1770), Ascanio in Alba (1771), and Lucio Silla (1772), as well as his first string quartets. At Salzburg in late 1771 he renewed his writing of Symphonies (Nos. 14–21). Paris was a vastly larger theater for Mozart's talents. His father urged him to go there, for "from Paris the fame of a man of great talent echoes through the whole world," he wrote his son. But after nine difficult months in Paris, from March 1778 to January 1779, Mozart returned once more to Salzburg, having been unable to secure a foothold and depressed by the entire experience, which had included the death of his mother in the midst of his stay in Paris. Unable to get hired for an opera, he wrote music to order in Paris, again mainly for wind instruments: the Sinfonia Concertante for four solo wind instruments and orchestra, the Concerto for flute and harp, other chamber music, and the ballet music Les Petits riens. In addition, he began giving lessons to make money. Mozart's years in Vienna, from age twenty-five to his death at thirty-five, cover one of the greatest developments in a short span in the history of music. In these ten years Mozart's music grew rapidly beyond the realm of many of his contemporaries; it exhibited both ideas and methods of elaboration that few could follow, and to many the late Mozart seemed a difficult composer. The major instrumental works of this period bring together all the fields of Mozart's earlier activity and some new ones: six symphonies, including the famous last three: no. 39 in E-flat Major, no. 40 in G Minor, and no. 41 in C Major (the Jupiter —a title unknown to Mozart). He finished these three works within six weeks during the summer of 1788, a remarkable feat even for him. In the field of the string quartet Mozart produced two important groups of works that completely overshadowed any he had written before 1780: in 1785 he published the six Quartets (K. 387, 421, 428, 458, 464, and 465) and in 1786 added the single Hoffmeister Quartet (K. 499). In 1789 he wrote the last three Quartets (K. 575, 589, and 590), dedicated to King Frederick William (1688–1740) of Prussia, a noted cellist. Mozart's development as an opera composer between 1781 and his death is even more remarkable, perhaps, since the problems of opera were more far-ranging than those of the larger instrumental forms and provided less adequate models. The first important result was the German Singspiel entitled Die Entführung aus dem Serail (1782; Abduction from the Seraglio ). Mozart then turned to Italian opera. Mozart produced his three greatest Italian operas: Le nozze di Figaro (1786; The Marriage of Figaro ), Don Giovanni (1787, for Prague), and Cosi fan tutte (1790). In his last opera, The Magic Flute (1791), Mozart turned back to German opera, and he produced a work combining many strands of popular theater and including musical expressions ranging from folk to opera. On concluding The Magic Flute, Mozart turned to work on what was to be his last project, the Requiem. This Mass had been commissioned by a benefactor (financial supporter) said to have been unknown to Mozart, and he is supposed to have become obsessed with the belief that he was, in effect, writing it for himself. Ill and exhausted, he managed to finish the first two movements and sketches for several more, but the last three sections were entirely lacking when he died. It was completed by his pupil Franz Süssmayer after his death, which occurred in Vienna, Austria, on December 5, 1791. Deutsch, Otto Erich. Mozart: A Documentary Biography. Stanford, CA: Stanford University Press, 1965. Gutman, Robert W. Mozart: A Cultural Biography. New York: Harcourt Brace, 1999. Parouty, Michel. Mozart: From Child Prodigy to Tragic Hero. New York: Harry N. Abrams, 1993. Solomon, Maynard. Mozart: A Life. New York: HarperCollins Publishers, 1995.